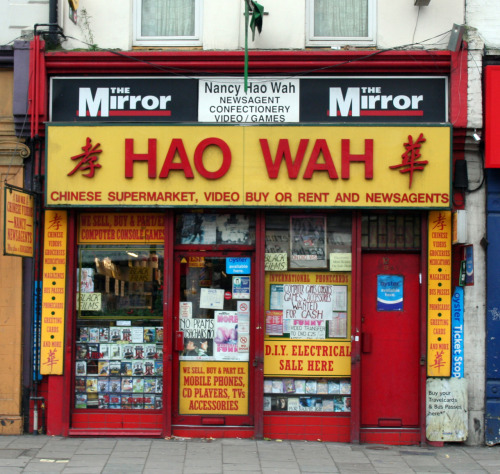 Hao Wah, Peckham High Street, SE15, from the London Shop Fronts blog. Click image to visit the site. As the London Shop Fronts blog reveals, every place in the world has a unique character that may be difficult to define, but is instantly recognizable. It's one of the things I love about Oklahoma City. I'm drawn to the flat, almost clinical documentary style of these photographs. Although these are architectural spaces, the frontal perspective flattens the real-life objects into an abstracted array of color and texture. And the homebrew typography is always wonderful. Related Paho Mann, photographer. See particularly the Reinhabited Circle-K series. Bernd and Hilla Becher, architectural photographers. See the Framework Houses series at the Boston Museum of Fine Arts for examples.